Substituting fossil fuels by more environmentally friendly alternatives requires the use of several economic tools that include taxes and subsidies. However, their efficient use implies several challenges: How to measure quantitatively the impact of those tools in the substitution process? 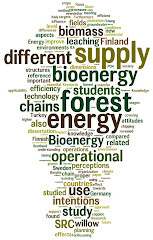 This recent publication aims at exploring the effects of these external factors that regulators can use for the promotion and establishment of forest-based fuels, by using a theoretical model for the Nordic sphere. 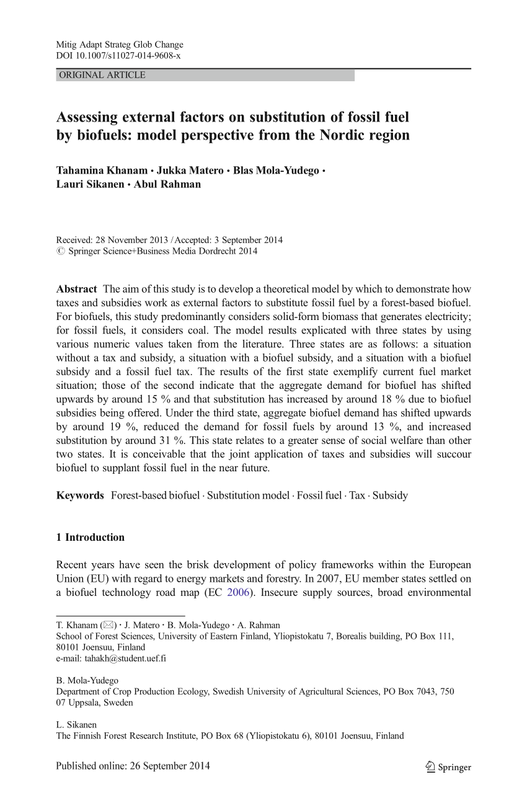 The aim of this study is to develop a theoretical model by which to demonstrate how taxes and subsidies work as external factors to substitute fossil fuel by a forest-based biofuel. For biofuels, this study predominantly considers solid-form biomass that generates electricity; for fossil fuels, it considers coal. The model results explicated with three states by using various numeric values taken from the literature. Three states are as follows: a situation without a tax and subsidy, a situation with a biofuel subsidy, and a situation with a biofuel subsidy and a fossil fuel tax. The results of the first state exemplify current fuel market situation; those of the second indicate that the aggregate demand for biofuel has shifted upwards by around 15 % and that substitution has increased by around 18 % due to biofuel subsidies being offered. Under the third state, aggregate biofuel demand has shifted upwards by around 19 %, reduced the demand for fossil fuels by around 13 %, and increased substitution by around 31 %. This state relates to a greater sense of social welfare than other two states. It is conceivable that the joint application of taxes and subsidies will succour biofuel to supplant fossil fuel in the near future.